Meet the successor GPRS-T2 ! GPRS-T2 is a GPRS/SMS module used in the intruder alarm systems for reporting and messaging via the GSM network. The main task of the module is to monitor the status of inputs. A status change triggers coded transmission of event messages to the monitoring stations via GPRS (e.g. to the STAM-2 monitoring station or the SMET-256 converter). Also available is sending a code by SMS messages to predefined phone numbers or any monitoring stations that support this format. In case of any problems with GPRS transmission, the module can automatically switch over to SMS reporting mode. For certain functions, it is also possible to use the CLIP service to identify the caller and display the caller's number. This allows toll free triggering and sending test transmissions. GPRS-T2 allows remote monitoring of the performance of various devices, including the alarm control panels not equipped with telephone communicator. 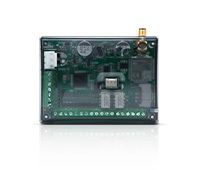 The module can be programmed and configured either locally via RS-232 or remotely via GPRS from a computer running the GPRS-SOFT program. Some parameters can be programmed using SMS messages. The module is provided with 5 programmable inputs, either digital (NO, NC) or analog. When configured as analog ones, the inputs can be used in automation systems, or for monitoring of a wide range of external devices, such as analog sensors of temperature, pressure and humidity. GPRS-T2 uses an industrial GSM phone and requires a SIM card with properly selected tariff plan or prepaid plan, making it possible to use GPRS technology. In the case of prepaid cards, the module also provides the ability to check the balance of available resources and account validity. The GPRS/SMS GPRS-T2 module meets the EN 50136 standard requirements for class 5 ATS.